Israeli armored vehicles entered the Balata refugee camp in the West Bank on Thursday in some of the fiercest fighting of the 17-month conflict. Israeli forces shot their way into two Palestinian refugee camps in the West Bank on Thursday, killing 11 people. BALATA REFUGEE CAMP, West Bank, Feb. 28  Israeli troops for the first time battled their way into this congested camp and into another camp, in Jenin, today, killing at least 11 Palestinians and losing one soldier in some of the fiercest fighting of the 17-month conflict. Jackhammer bursts of Israeli machine-gun fire echoed off the surrounding hills as soldiers on foot and in hovering helicopter gunships traded shots throughout the day with Palestinian gunmen, who ducked in and out of alleyways too narrow to admit tanks. Their lights flashing red, ambulances waited by the charred shells of cars on Balata's outskirts, regularly darting inside to scoop up another wounded Palestinian. The numbers of the wounded ran into the dozens, hospital officials said. Although Israel has bombed targets in refugee camps before, the raids marked the first time ground troops had invaded such camps. 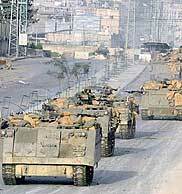 The soldiers did not make it far into Balata or the Jenin camp, and encountered heavy resistance in both. The Israeli government said the goal of today's raids had been to deny Palestinian militants havens to manufacture explosives and plan attacks. But Palestinian militants called the Israeli attacks a provocative escalation and promised reprisals, particularly for the attack on Balata, a stronghold of Yasir Arafat's Fatah faction. This afternoon, gunmen opened fire on Gilo, a Jewish neighborhood of Jerusalem occupied in the 1967 war. Israel did not spell out why it had chosen to launch the attacks today. One Israeli commander, Colonel Aviv Cochavi, said he was ordered to plan the operation several days ago. Fatah militants recently stepped up attacks against Israeli soldiers and settlers in the West Bank, and Israeli security officials say some of the militants' leaders hide in Balata. The new violence came as Palestinian officials and Arab leaders were praising an initiative floated by Saudi Arabia to resolve the deepening impasse. The plan would trade normalization of Arab relations with Israel for an Israeli withdrawal from the West Bank and Gaza Strip, lands it occupied in the 1967 war. Although some Israeli officials have praised the Saudi proposal, the Israeli prime minister, Ariel Sharon, has kept his distance from it and his associates have played down its significance. George J. Tenet, the director of central intelligence, and William J. Burns, assistant secretary of state for Near Eastern affairs, were in Saudi Arabia today for talks with Crown Prince Abdullah on his peace proposal. The Israeli Army urged residents of the Balata camp who were not fighters to flee. But as residents from neighboring Nablus gathered a block from the camp's edge to watch, few Balata residents appeared to be leaving. Some said they had nowhere else to go. Others said that, having become refugees during the 1948 Arab-Israeli war, they were not about to leave their homes again. "We were refugees already twice," said Mahmoud Diyab, 80, who said he was pushed out of homes in 1967 as well as 1948. "Where to go now?" The raid here began shortly after midnight, camp residents said, with a helicopter strike that knocked out the electricity. Palestinians accused Israeli forces of destroying some cinder-block homes as they punched through the camp's perimeter. Balata is the largest West Bank refugee camp, with 22,000 residents packed into an area less than a third of a mile square. Israel regards it as a command center for the Aqsa Martyrs Brigades, a group linked to Fatah that has carried out several devastating attacks against Israelis. Israeli soldiers killed four Palestinians here, Palestinian officials said. One of them, Kayed Abu Mustafa, was a leader of the Aqsa Brigades, Palestinians said. An Israeli soldier was killed in the fighting, but the army declined to describe how. In Jenin, Israeli soldiers shot dead six Palestinian security officers and one 65-year-old man. As gunfire rang through the streets and the smell of burning garbage and tires filled the air, some taxis made their way through Balata and barefoot children played in alleyways. One slender young girl smiled brightly as she rushed up to a stranger to display a pair of adult-sized blue jeans stained with blood. As he stood outside his home in a bathrobe, pajamas, and black slippers, Daoud Abu Hamdon just shrugged when asked why he did not take his family and leave. "I believe it's safer for me to stay here," he said. Young Palestinian men carrying semiautomatic rifles cast wary glances upward as they cursed two American-made Apache helicopters patrolling overhead against a pale blue sky. Since Israeli tanks could not roam through the teeming camp, the militants believed that they stood a good chance against the soldiers, if it were not for the helicopters. "If Sharon is a man, let him confront us without Apaches," said one 30-year-old gunman, referring to the Israeli prime minister. "Let him fight us the honorable way  man to man." Late Wednesday night, a female suicide bomber from the Aqsa brigades blew herself up by an Israeli checkpoint in the West Bank, wounding three border policemen. Unlike the Islamic groups Hamas and Islamic Jihad, the Aqsa group has embraced the use of women and set up a women's unit, named for Wafa Idris, another female suicide bomber, said Naser Badawi, a senior member in Balata of the group. Colonel Cochavi, a brigade commander of Israeli paratroopers involved in the Balata operation, called the camp "a greenhouse for hostile terrorist activities." He said that the soldiers "have no intention whatsoever to harm an innocent person. We are making all the arrangements necessary to ensure such people will not be hurt." But he acknowledged, "I have no doubt that fighting in a densely built area has its share of disadvantages." Palestinians in the camp accused the Israelis of firing recklessly. Marwan Barghouti, the leader of Fatah in the West Bank, called for mass demonstrations on Friday to protest what he called "the cruel massacres taking place." Yossi Sarid, the Israeli opposition leader, called the mission "total craziness," urging Mr. Sharon to immediately withdraw Israeli forces from the camps. "This is a new phase in the war for the safety of the settlements," he said. [In a statement issued in New York, United Nations Secretary General Kofi Annan called for the immediate withdrawal of the Israeli forces from the refugee camps and implored both sides to avoid further civilian casualties. ["What distresses me particularly is that this time, as a result of incursions into refugees camps by the Israel Defense Forces, large numbers of Palestinians are reported dead or injured," said the statement from Mr. Annan, who was in Germany on Thursday. Palestinian gunmen claimed to have penned 14 Israeli soldiers inside a boys school here, but the army dismissed that assertion, confirming that the troops had seized the school but denying that they were under siege. It said that the soldiers entered the school while it was empty. Like the refugee camps generally, the boys school is administered by the United Nations agency that looks after Palestinian refugees. In a statement, the agency said that the school had "suffered considerable damage," and it expressed "deep dismay and concern at the heavy casualties and loss of life" here and in Jenin. Palestinian militants also claimed they had planted explosives around Balata that they had used to damage seven Israeli tanks. The army ridiculed that claim. But Israeli security officials said that Fatah militants in Balata had manufactured and stockpiled explosives in several buildings here. Palestinians here had expected an attack for days. After Palestinian gunmen killed six Israeli soldiers at a West Bank checkpoint on Feb. 19, Israeli forces moved into Nablus and seized four Palestinian buildings overlooking the camp. Residents of Balata had shoved trash bins and ruined cars across the streets entering the camp in hopes of blocking any invasion.